Located in Northern Thailand, Chiang Mai is often known as the more cultural and laid back version of Bangkok that our parents like to visit. Unless you have a keen interest in temples, pagodas and history, you’d have probably given this city a miss. Given 6 days to explore, little did we expect to find ourselves short on time, unwilling to leave at the end of the trip. Whether you’re an adrenaline junkie, an animal lover, a cultural buff (or all of the above), the truth is, Chiang Mai really has something for everyone. And the best of all, everything was relatively cheap! We were spoilt for choice with designer hostels, filled our tummies to the brim at bustling night markets, and had trouble deciding which adventure sport to squeeze in with the limited time we had. Its growing cafe scene — modernly designed layout, offering a good brew and quick wifi — has also made it a popular destination for many backpackers as well as digital nomads. So here’s our guide to how you can experience the thrills of this up and coming city! Prepared to get your feet dirty in this! Many level 4-5 rapids to make your money’s worth! Flight of the Gibbon — the single longest zipline in Asia at 800m! Pro-tip: Book via Klook and get US$3.50 (or SGD$5) off for first time users. Simply use our promo code “KLOOKTTI” on your mobile app. Click Promotions and enter the code. Would you dare jump 10-20m off these cliffs? *Pro-tip: Unless you’re a diving pro, aim to land feet first and hands by your sides for a less painful experience. Lesson learnt: Don’t be garang on your first jump! Chiang Mai’s nickname is in fact, the mountain biking capital in Thailand so this activity is not to be missed if time permits! Mountain biking companies offer 3 hour – 2 day trips speeding on downhill single tracks through metres of greenery flanking your peripheral view — makes for a great way to unwind, the adrenaline junkie way. Elephant rides and the opportunity to take selfies with Tigers are one of the top 2 most popular activities in Chiang Mai. However, there’s a lot of doubt regarding the welfare of these animals — the conditions they were trained to perform or act in a docile manner totally unlike their wild, natural self. 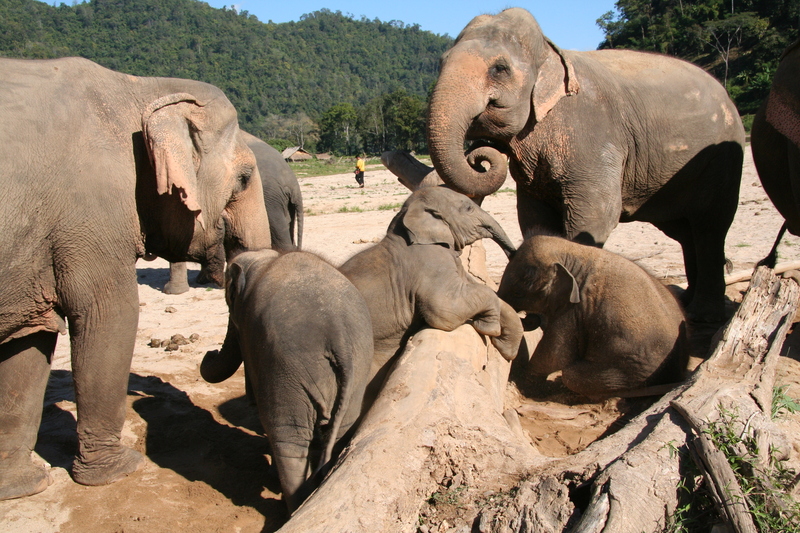 An elephant rescue and rehabilitation center, The Elephant Nature Park allows you to volunteer for a day to a week, taking care of elephants — feeding, bathing and cleaning up after them. You’ll learn about the past of each elephant and the stories of how they were rescued. Unlike the commercial elephant camps where you watch the elephants “perform” while you watch from the sidelines, at Patara Elephant Farm you get the experience of being the owner of one for a day! You’ll learn all the skills you need to check its health (we heard poop is involved), ride it bare back in the most natural way, and even shower them at a waterfall. There are a ton of reviews raving about the incredible experience offered here — something we’d definitely sign up for when we’re back in town. With over 300 temples, wats are another endless option to choose from in Chiang Mai. If you’re short on time, here’s our recommended top 3! Located up in the mountains of Doi Suthep national park, this temple overlooks the city offering a panoramic view of Chiang Mai from the top. The 300 over step to the top is believed to help devotees receive Buddhist merit. *Pro-tip: If these steps up look too daunting, there’s a funicular option available for a ฿20 top up. Ticket booths can be found on the right side of the stairs. Famous for housing an important Buddha statue (Phra Buddha Sihing) — an original 14th century treasure, this is one of the most revered temples in Chiang Mai. One of the most recognisable temples in Thailand, the white temple is located a 3-hour ride up north in the city of Chiang Rai. Its glowing white, intricate design is unlike any other temples you’ll see in the country. Privately owned, the designer included some pop culture characters of the generation into the design — look out for Iron man, Deadpool and even the minions! Unfortunately nothing on the menu here costs ฿1 but for reasonably priced dishes between ฿60-120, this is the place to get your Thai food fix.The portions are on the small side but that means you’ll have stomach to try more dishes :P We especially loved their Tom Yum Goong! On the same street as the 1 Baht restaurant, is a nice cafe style local restaurant that serves up a mean Yum Woon Sen (glass noodle appetiser topped with colourful veggies, crushed peanuts and spices!). The other dishes weren’t spectacular but the dishes are pretty cheap so still great to drop by if you’re in the area. A cafe popular amongst tourists, the menu serves mainly fusion vegetarian dishes — think hummus, felafel and avocado sandwiches — but include a couple of fish dishes. On Saturdays, this place becomes 10 times livelier with the entire street lined with street food stores, clothes, accessories and probably 90% of the items you might find at Bangkok’s Chatuchak market. But even when it’s not Saturday, there’s still a couple of regular push cart stores selling the usual Pad thai or wanton egg noodle soup — simple but yummy! Unlike the Saturday Market, this one only appears on Saturdays — on a street in the middle of the Old city. On all other days, there are shops running businesses as usual but on Sundays, the entire road is closed off to vehicles and given to shop owners to set up their own store. We had one of the spiciest basil rice (the tear inducing sort) which was nicely soothed by the thai iced milk tea store next to it. Most of the action usually happens around the Old Chiang Mai City — segmented by a square moat, just 10 minutes away from the airport. While there are many budget hostel choices available for as low as ฿90, (usually located outside of the Old City), we though we’d introduce you guys some of the more hipster/cosy options in this city, still within a reasonable budget. Modern minimalist vibes, there was so much we loved about this place. Amazingly clean (even their floors), delicious breakfast (they try to give a variety everyday) and friendly staff! The receptionist Beebee was extra friendly and patient in helping us plan our activities and other queries even if we weren’t getting it from the hostel. It’s also located really near Wat Phra Singh and the Sunday market. We felt a little reluctant when we had to leave..
Tell the driver: Arak Soi 5 near Wat Phra Singh. The hostel is just diagonally opposite the Wat. Located just outside the Old city, the full length glass panel reception room looks nothing like a hostel. Possibly the most posh hostel we’ve even been in – everything from the gates, to the common areas to the rooms seem to be incredibly well thought out by the designer. Rooms are accessed by a magnetic key card, and the private rooms even come with your own sink. There are bean bags scattered around the common areas with great WiFi to boot! The artisan cafe attached downstairs also serves up a good Thai iced milk tea (strong tea, not as sweet as the usual), and delicious looking pastries. A conducive little space for digital nomads! Chiang Mai may not have an extensive public transport system like in Bangkok but it’s still pretty convenient getting around. Taxis aren’t common either apart from the airport and too costly to travel short distances around the Old city area. Here are your next best options! If you’re traveling in a small group of 2-3, these are probably the best option to get from point A to point B. Although it requires a bit of bargaining, the quoted price usually isn’t as hiked up as other cities like Bangkok. Alternatively if you’re alone, a better option might be taking these red pick-up trucks commonly seen around the city. Apparently there’s different colored Songtaews that go towards a specific region but these red ones roam around the old city without a fixed route — like a public carpool. Bargaining isn’t required as they charge a decent flat rate for getting around the city. Just flag them down as you would a public bus and ask if they will get to the place you are headed. (It normally takes about 3 tries at most). The emptier songtaews usually have a higher chance of taking you to your destination as drivers are normally quite flexible, picking up other passengers along the way. One of our favourite ways of getting around is by renting our own transport! This is great for exploring an hour’s distance from the old city or if you’d like to head out extra early to chase after sunrises. Currently, Scoot is the only budget carrier that flies direct to Chiang Mai from Singapore. Flights run on alternate days — Tuesday, Thursday and Saturday leaving Singapore at 12pm and Chiang Mai at 2:45pm. If you’re planning to order food on board, we recommend the Nasi Lemak option! This is a nice Chiang Mai guide the places here are full of adventures, so it is good for tourists to enjoy in such a manner.